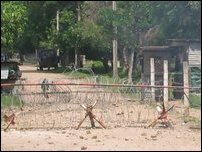 Hundreds of students of Hartley College and Methodist Girls High School located in the High Security Zone (HSZ) in Point Pedro setup road blocks and protested against the Sri Lanka Army's (SLA) attempt to construct a new checkpoint on College Road leading to both schools, Monday at 8 a.m., sources said. SLA soldiers fired warning shots into the air and tear gas to disperse the protesting students. Students demanded dismantling of the new sentry point and not to introduce additional obstacles to students attending both schools. Members of Sri Lanka Monitoring Mission (SLMM) arrived at the scene to defuse tension in the area. Families living along College road, temporarily moved out of their homes during the morning confrontation.